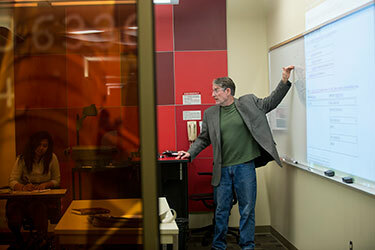 The Center for Teaching and Learning (CTL) offers a variety of customized, confidential methods through which all faculty – full-time, adjunct, and GTAs – can obtain useful feedback about their teaching. The following services are some of our most popular, but if you have ideas beyond what is listed here, please feel free to reach out and start a dialogue about alternative options. To ensure we can best serve as many faculty as possible, we ask that faculty submit scheduling requests no later than Week 4 of the semester. Sometimes a second set of experienced eyes can be a lifesaver, and this is especially true when it comes to course documents. Faculty can connect with CTL to get feedback on their syllabus or other teaching documents before, during, or after the semester, either as a stand-alone service or in coordination with the other options described below. A faculty member may request an in-class visit by an experienced CTL observer. After a consultation in person or through email regarding the faculty member's specific needs or concerns, the CTL observer will visit the instructor’s classroom space – virtual or physical – at an agreed upon time. Afterward, the observer will provide written, confidential feedback that outlines what the faculty member is already doing well and, if desired, specific areas and techniques for improvement. Afterwards, the faculty member and observer can meet for an in-person discussion of this feedback. The CTL can facilitate the collection of feedback from students at midterm to aid faculty in making advantageous adjustments while the course is in session. This facilitation is fully customizable; we can gather student responses verbally in a focus-group style workshop, through a brief written survey in class, or as part of an online survey, and the questions can be tailored specifically to address areas of faculty concern. This feedback is summarized anonymously in report form and supplied anonymously to the faculty member in a timely manner, which allows faculty to address student concerns mid-semester where appropriate.